Here are four questions everyone should answer for themselves before undertaking a decking project. 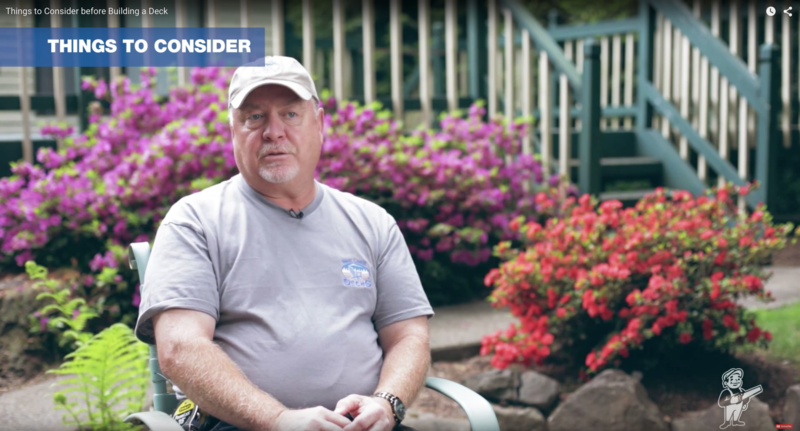 Dunn Lumber partnered with professional deck builder Ron Spillers, from West Coast Decks, and created a series of videos that cover a variety of decking questions. In this video, Ron covers four questions everyone should answer for themselves before undertaking a decking project. Taking the time to think through each question will help determine the size, scope, and cost of creating a beautiful, useful, and cost-effective deck. For more in this series, click here. A budget will influence every other decision. Even—especially—if you're planning on building the deck yourself, you need a budget. Manufactured decking products are an investment and can add up quickly. As a deck gets bigger, so will the cost. A budget will determine the size, scope, and materials needed to build the deck. What's the Primary Purpose of Your Deck? Is it a place to sit outside and enjoy the sunshine? Will you be doing some barbecuing and entertaining? Does it need to be a safe (and contained) area where children and pets can play? How Are You Going to Come and Go From Your Deck? Give this a lot of thought. Adding a stairway to an upper-level deck that connects to a dining room or bedroom creates easy access to that level of your home. Do you want everyone to have that sort of access? Stairways are more costly, so go back to the budget—have you made allowances for a stairway? What Kind of Products Do You Want to Use? Does a traditional wood deck sound up your alley? Or, would a lower maintenance, more durable, synthetic product make more sense? Will the deck have a railing? The railing is what gives a deck its character. Do you want traditional cedar railing, low-maintenance metal railing, or composite railing? Have any questions about this post? Comment below. Or to talk in-person with a Dunn Lumber professional about your decking plans, visit this link. Sarah Smith of Sawhorse Revolution and Catie Chaplan of the Wood Technology Center discuss the role we all play in supporting the next generation of industry professionals. Kebony Modified Wood: What Is It? Andy Kehl of Kebony unpacks the basics of their modified softwood—and discusses why it's such a great choice for decks and other structures in the Pacific Northwest. We recently added a new product line to the shelves at all of our Dunn Lumber branches: OZCO Wood Ties. Get our monthly Solutions newsletter in your inbox! The use of this site is an acceptance of the Dunn Lumber Terms and Conditions. Dunn Lumber and its partners cannot and do not guarantee the accuracy or completeness of the information, materials, or advice on solutions.dunnlumber.com.